The CCHR booth at the National Student Nurses’ Association Convention in Nashville, Tennessee, April 2018, is inundated with visitors demanding materials. Students at a national nurses convention wholeheartedly appreciate CCHR’s work. 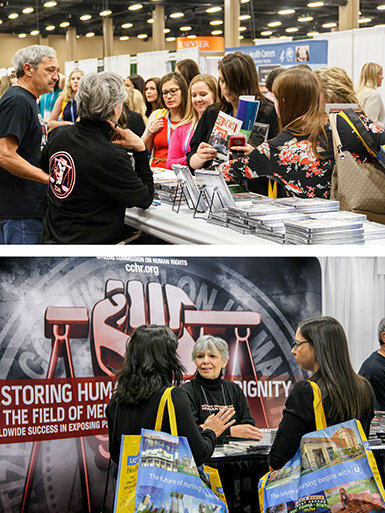 At the annual convention of the National Student Nurses’ Association (NSNA), CCHR’s booth attracted a non-stop flood of attendees to its display of complimentary CCHR documentaries, booklets, informational portfolios and education packages. NSNA is dedicated to fostering the professional development of nursing students. Therefore, CCHR was there to provide vital information for those who will have the lives and well-being of many in their hands. Such was the interest from the nursing students for the CCHR information, that soon one volunteer was assigned to the single job of replenishing the stock of materials on the table—materials which vanished as soon as she placed them there. One volunteer wore a T-shirt proclaiming “Childhood is not a mental disorder” and was peppered with regular comments of agreement and also realizations that yes, indeed, regular childhood behavior does not require medication to “treat” it. In total, 1,136 CCHR informational materials were provided to nursing students to inform them of the truth about psychiatry. Here is what some of the groups and individuals CCHR works with had to say about our mission to reform mental health. With CCHR, the psychiatrists don’t stand a chance, because now they are exposed for all their wrongdoing. Hopefully this means that people are going to take a long, hard look at what psychiatry is doing and what the drug manufacturers are doing. Psychiatrists take advantage of the ignorant; patients are misled and eventually become victims and some even die. We could equate this treatment with the Nazis. People are being made slaves, their property. The psychiatric industry is getting children addicted to drugs and they eventually end up in psychiatric institutions where there is no future. With CCHR I have hope. It is the task of CCHR to educate South Africa and the world. I was astonished at the professionalism of the documentaries and the personnel speaking in them—prominent psychologists, psychiatrists, doctors and other health professionals. They are absolutely enlightening. How wonderfully courageous your organization is to produce and market these, and how beneficial they are to the community and health practitioners who really don’t know what is going on. Our doctors are no longer healers, they have become drug pushers most of the time. That’s the tragedy. It is no longer just the psychiatrists prescribing, it is the regular medical doctor prescribing psychotropic drugs to anyone who walks into the clinic. I feel a lot of gratitude to CCHR. As a nonprofit mental health watchdog, CCHR relies on memberships and donations to carry out its mission to eradicate psychiatric violations of human rights and clean up the field of mental health. To become part of the world’s largest movement for mental health change, join the group that has helped enact more than 180 laws protecting citizens from abusive psychiatric practices. Order the Making a Killing documentary.